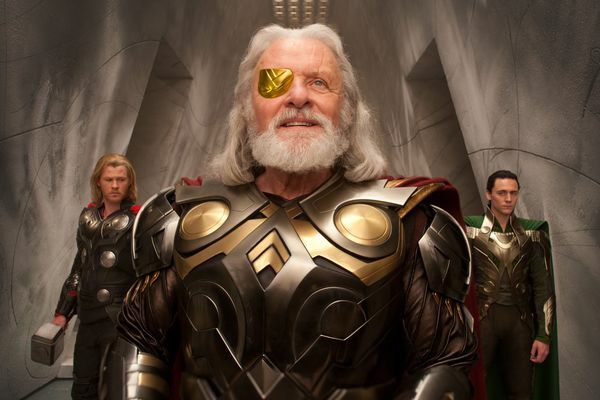 Marvel just released an official photo showing Asgard's royal family: Thor (Chris Hemsworth), Odin (Anthony Hopkins) and Loki (Tom Hiddleston). Still a little disappointed that Thor's helmet is omitted and now Loki's horns are also not present on this photo. But no doubt the costumes looks cool. Still looking forward to see a full body photo or maybe a teaser trailer. On the other news, also heard that both Thor and Captain America are planned to be released on 3D. But before you get excited, I just want to say that both movies are not shot in 3D but only be post converted like Clash of the Titans. Oh crap here we go again. If it is meant to be 2D then it should be 2D, oh well can't help the Distributors and Studios if they want to jump in the 3D hype (which is so overrated). I also think that they may still incorporate the Asgard God's helmet later on the film. A display of the head gears were displayed at the Marvel booth in Comic-Con, so it maybe a hint that it will eventually be in the film... just maybe.